Promoting the SKARAB FPGA supercomputer is taking me to interesting and beautiful places in the world; like the Penticton area of British Columbia, home to the Dominion Radio Astrophysical Observatory (DRAO), a National Research Council Canada site. Since 1960 its researchers have developed instrumentation for telescopes around the world and created new technologies for future telescopes, in very well-equipped labs for RF and digital electronics engineering. A great place to work and live for the lucky few who gain a post. 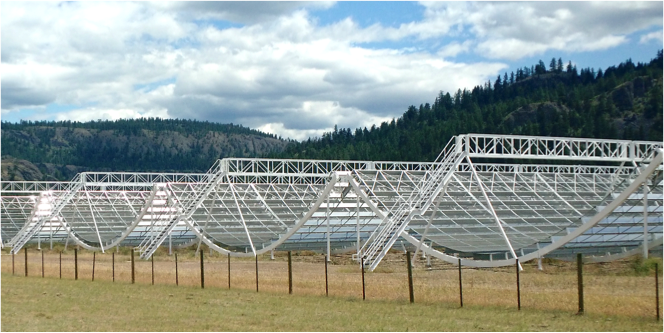 One of the unusual telescopes at DRAO is the Canadian Hydrogen Intensity Mapping Experiment (CHIME), a relatively low cost way to radio map the distribution of neutral Hydrogen over the largest volume of the universe ever observed. Using the rotation of the earth, the fixed beam telescope will scan with enough spatial resolution to discern the "baryon acoustic oscillations" that were imprinted on early cosmic structure, enabling cosmologists to understand accerating expansion (inflation) of the infant universe. CHIME consists of five 20m by 100m cylindrical reflectors covering an area about the size of three football fields. Unlike space probe efforts planned by US and European agencies, the CHIME team is seeking to scoop these much more expensive efforts with their terrestrial telescope -- in much more pleasant surroundings than outer space!